Barletta Heavy Division Inc., a Canton-based heavy equipment operator, was recently cited by officials with the Occupational Safety and Health Administration (OSHA) for a number of work hazards and dangers on the work site that could have seriously injured employees. The site in question was the on in Amesbury where crews were working to replace the Hine Bridge. The company is now facing more than $90,000 in fines. The investigation was the result of a work accident that happened back in March when one of the cranes hit a power line and seriously injured a worker. The Andover Area OSHA Office was in charge of conducting the investigation. Officials found that there were a number of incidents in which cranes had struck power lines during that one project. The company was also busted for not conducting hazard assessments, neglecting proper signage and failing to ensure that each worker was qualified to work on the site. Our Amesbury workers’ compensation attorneys understand the dangers that accompany working with cranes. 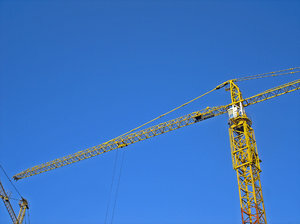 As a matter of fact, the U.S. Bureau of Labor Statistics (BLS) reports that there were more than 70 work fatalities resulting from work with cranes last year. These fatalities include accidents in which the source of the injury was a crane, the secondary source of injury was a crane or where the worker was operating a crane. During that year, 30 of the deaths were fatalities caused by being hit by a falling object. Nine of these deaths were a result of the crane striking the victim and the others were killed when an object the crane was transporting fell onto them. A majority of these accidents could have been prevented had employers taken the proper safety precautions to help to protect workers. “We issued a citation for a willful violation due to the fact that the employer knew of the power line hazard and did not take steps to correct it,” said Jeffrey Erskine, OSHA’s area director. Workers that are oftentimes exposed to these kinds of dangers are brazers, solderers, cutters, welders and electricians. Before launching work, employers are required to make sure that the site has been assessed and that all of the dangers and hazards are mitigated. There should be a crane safety plan established. There should also be a competent person that is assigned to oversee crane operations. This person should possess the authority to stop unsafe operations. Employers are also required to make sure that each and every employee is trained to work with this equipment and trained to not only point out dangers, but on what to do in the event of an emergency. Avoiding a potentially fatal work accident required a strategic plan and proper training. Contact the Law Offices of Jeffrey S. Glassman, LLC if you or someone you love has been injured on at work. Call 1-877-617-5333 for a free and confidential consultation to discuss your rights.